Some people are self-conscious about a gap between their teeth. If you have a tooth gap that you want removed, there are several ways to effectively fix it. New Orleans cosmetic dentist and accreditation candidate Dr. Duane Delaune can determine which treatment is most effective for your case, and remove your gap so that the correction looks natural and beautiful. Tooth bonding can be used to fix a small tooth gap. With tooth bonding, dental composite is applied directly on your tooth. The composite is available in many shades and translucencies, and Dr. Delaune has the knowledge of bonding materials and the artistry required to perfectly match the color of your natural teeth. The surface of the tooth on either side of the gap will be roughened. The composite will be applied on the tooth, shaped, hardened and polished. This procedure can be completed in one appointment. 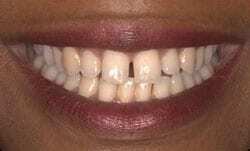 Your teeth that previously had the gap between them will look natural and beautiful. 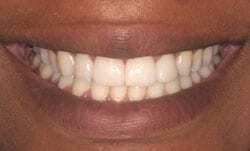 See the beautiful result after Dr. Delaune used tooth bonding to close the spaces between a patient’s teeth. If a tooth gap is large, using tooth bonding to close it can cause your teeth to look bulky and large. Several teeth will need to be reshaped for a large gap, so porcelain veneers will produce a better result. Porcelain veneers are thin layers of porcelain that are bonded to the front of your teeth. The veneers are custom made for you in a color and shape that make them look like your natural teeth. Porcelain veneers can be placed in as few as two weeks. They are more expensive than tooth bonding, but the results are beautiful. Braces are a third way to close a tooth gap. Braces will move the teeth closer together, eliminating the gap. Unlike tooth bonding and porcelain veneers, with braces nothing artificial is permanently attached to your teeth. But braces are the most expensive option for closing your gap, they are uncomfortable, and depending on the size of the space between your teeth, it can take several months to two years to close it. Dr. Duane Delaune is an accreditation candidate of the American Academy of Cosmetic Dentistry. Dr. Delaune has post-graduate training in cosmetic dentistry. He will ensure that the cosmetic treatment you receive to close your gap looks natural and beautiful.